When registering for the race, those participating in a wheelchair are kindly requested to check the appropriate box to indicate this. As the date of the race draws closer, wheelchair participants will receive information relating to their safety and that of others participants. People with disabilities participating in the Íslandsbanki Reykjavik Marathon may, if they so wish, be accompanied by one person without any extra charge. Accompanying persons will be given special signs authorising them to be on the race course, but will neither be timed nor receive a shirt or any other race material. For purposes of registration, the accompanying person's name must be mailed, together with the name of the relevant race participant, to the address skraning@marathon.is. The accompanying person will be able to pick up a specially marked sign at the resolution desk operated during the Expo. All those participating in the Íslandsbanki Reykjavik Marathon do so at their own responsibility. The race course is not completely closed for traffic so it is very important to exercise caution. We would also like to draw attention to the fact that certain sections of the course can be difficult to navigate in a wheelchair. Examples of this include speed bumps as well as rough or uneven surfaces, which can be treacherous. For security reasons, those participating in a wheelchair or using other assistive equipment must line up behind other participants at the start of the race (see further information here). 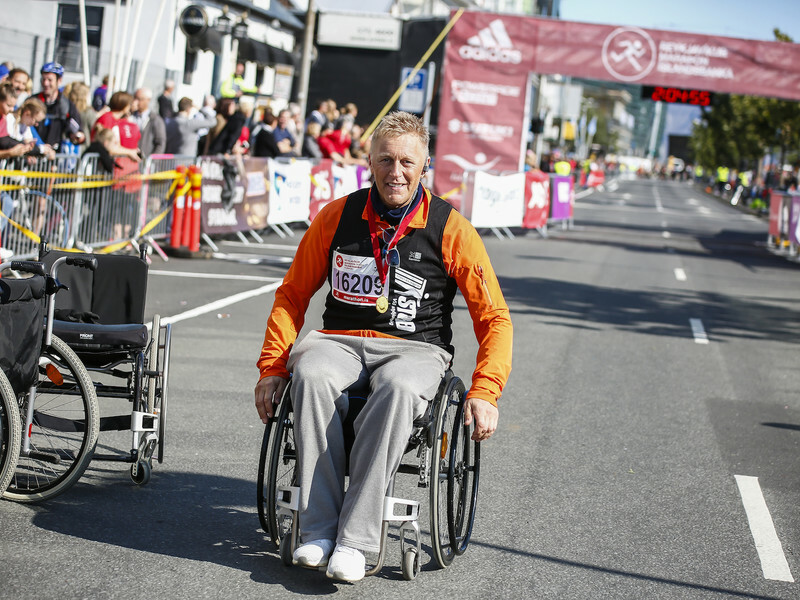 The Islandsbanki Reykjavik Marathon to be held on August 24th 2019 will for the first time include a half marathon wheelchair race if at least three male and three female will register. This race is reserved for participants in racing wheelchairs in category T51 - T54. Participation in the wheelchair race is subject to an application process. After registering for the general event, an application must be mailed to the address skraning@marathon.is. The application must state the participant's estimated time to complete the race and/or the time from another racing wheelchair race. The participant's name and email address must also be included. Applications must be received before 1 August. Those who have earned the right to participate in the wheelchair race will be started as one group in accordance with the starting schedule, to be communicated to participants at a later date. Prizes will be awarded to the 1st, 2nd and 3rd place winners in the men's category as well as to the 1st, 2nd and 3rd place winners in the women's category. Please note that the wheelchair race will only be held if three male and/or three female participants register. All participants will receive a medal when they cross the finish line in the Íslandsbanki Reykjavik Marathon and their time will show in the results of the race if they took part in one of the timed distances. Wheelchair participants are not eligible to win a prize for placing in the top three in the main race.